I was running through Walmart Tuesday night when something dawned on me: I never finished reviewing all the Breyers BLASTS! flavors! oh the horror! Ok, as frozen dairy desserts it's not exactly a huge loss, but I just did a check and I've only tested 4 out of 16 BLASTS flavors. I think it's time to dig into #5! I'm actually fairly surprised that I went 7 months without testing something based on waffle cone pieces, that's totally unlike me hehehehe. 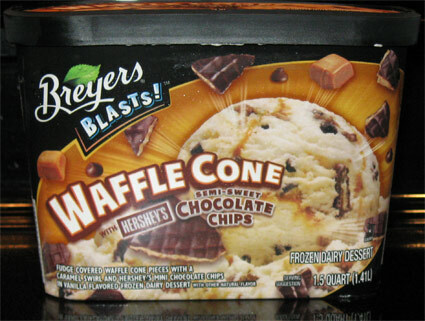 Sorry, this is Breyers BLASTS! WAFFLE CONE with Hershey's semi-sweet chocolate chips. The packaging certainly makes it look good enough (I'm looking at you Gifford's). Wow, there's no shortage of bits in there!! This is crazy and I'm loving every minute of it. Go on, try to count all the bits without getting excited. Can't do it, can ya? If you think back to my review of Breyers OVERLOAD Waffle Cone, you will remember that I mocked it for not having enough mix-ins. I am so glad we don't have that problem here, and hopefully they've corrected the caramel issue as well. Hmmm, well, not exactly what I was expecting for waffle cone bits. 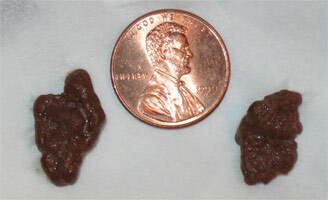 These definitely aren't big chunks of chocolate coated waffle cone like those I found in Haagen-Daz Caramel Cone. It's weird because if you squish one, instead of a waffle cone chunk inside, it's like tiny waffle cone slices or bits thatdidn't photograph well, but I guess I should try again (note: I tried again but ate the sample before I grabbed the picture). Enough talk, you need to know how it tastes. The biggest surprise to me is the enormous amount of tiny chocolate chips and cone bits. This is the kind of ice cream that you really have to chew because it's just that crunchy. That's not a negative since I dig that from time to time, just be warned incase you don't like that. The biggest downfall for me is that sometimes I get this mild burnt waffle cone vibe. I don't know if they are literally burnt or it's just some weird combination of all the flavors, but it bothered me on the first scoop and thanks less on the second scoop. When you can ignore it (or interpret it better than I do), the overall flavor is pretty good. I guess I should just tell you to be prepared for a stronge waffle cone flavor. Another notch against this one is the fact it is a frozen dairy dessert. It melts quick and isn't even remotely filling. I won't say it's a complete drawback because it kind of reminds me of those final ice cream cone bites where the ice cream is just going everywhere so you shove in the last few melted bites before you make a complete mess. Hmmm, let me put it another way: the quick melt nature really let's the flavors blend together. Pretty much every bite has that caramel waffle cone flavor. I can finish a bowl of this stuff in seconds. I realized you didn't try a lot of the Blasts when I went to the store Wed night to pick one up and saw all the flavors..I tried the Reese's and lemme say it's nothing great although I'd welcome your critique..not a lot of mix ins but the few that were in there were chunkier than what this sounds like. I never really gave much thought to why I'm not full after eating these though until you mentioned the "frozen dairy dessert" element - thanks! Couldn't finish it. Im finding these "frozen desserts" to be uneatable. It doesn't even taste like vanilla ice cream it tastes like cold crisco. First time in years I actually turned down dessert and gave it away. Couldn't agree with the 2 previous comments more... What happened to Breyers, the brand whose commercials used little kids trying to read ingredient lists of other brands, while their list had simple ingredients like milk, sugar, etc? I've tried a few of these "frozen dairy desserts" now, and I don't see myself going back to Breyers anytime soon. I think it was the first time ever that I threw out most of a container of ice cream (oh wait, it's not ice cream, is it?). Breyer's is officially the worst ice cream out there. Turkey Hill, the cheaper brand, is superior, which isn't saying much as Turkey Hill is barley tolerable. But Breyer's has officially lost all of it's magic from years ago. I just purchased 1 Cookie Dough and 1 Waffle Cone Blasts ice cream and tried each of them. 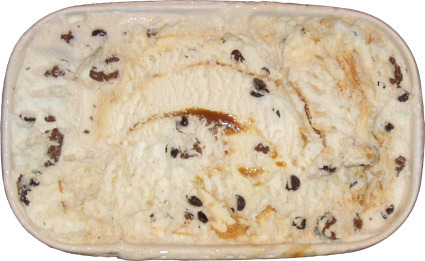 First, the Cookie Dough contained virtually ZERO cookie dough and zero chocolate chips! This is what I call false advertising. Second, the Waffle Cone tasted like cheap caramel mixed with those cheap 25cent ice cream bars that you'd buy in the frozen section of your local supermarket. Disgusting. I flushed them both down the toilet and opted for Ben And Jerry's. Although B&J has also diminished in consistentcy and quality the last few years, they still have a ton of flavors to choose from, all of which are very faithful to the label. But Breyer's has officially gone down the crapper. And this is posted in 2015, years after this review was made so nothing has changed. Other than Uniliver robbing people at the supermarket checkout line. Bad job Breyers! Shame one you!